7.2 million people across the United States have at least one fish tank in their homes. If you’re among these fish owners, you should already know about the importance of a filter. Filters keep your fish’s water clean and safe for them. Canister filters are just one type to choose from, and we’re going to go over a few reasons why you might choose one, and our top seven picks. Keep reading to find out more about the best aquarium canister filters. Want More Information About Filters? Before we get to our top picks, let’s go over the top three reasons you want to use one for your tank. First and foremost, canister filters are great at removing particulate matter from the tank. This alone makes them a great choice, especially if you have a tank that’s 40 gallons or more. 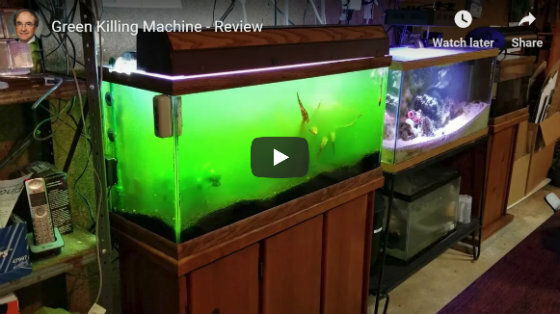 Not all bacteria are bad, which is why fish experts add special media to their filters that provide ideal living environments for beneficial bacteria. Filter media comes in a variety of sizes, materials, and shapes. The benefit of using a canister filter is that most are designed to hold several different types of media if you want to try different combinations. This allows you to provide the right home for the bacteria that will most benefit your fish. If you put a lot of work into making your tank look spectacular, it’s disappointing to ruin the look with a filter. That’s why people that create show tanks love canister filters. Because the bulk of the filter is on the outside of the tank, it’s easy to hide it so you can simply enjoy the beauty of the fish and decorations. 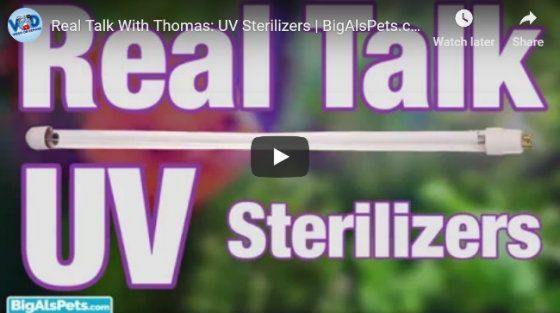 Now let’s take a moment to talk about UV sterilizers and why you would want a canister filter that has one. A UV sterilizer uses ultraviolet (UV) light to kill or incapacitate microorganisms. Traditional filters rely on physically removing bacteria from the fish tank. However, that doesn’t guarantee the tank will remain clean as some bacteria can slip through the cracks. A UV light prevents any of these harmful microorganisms from escaping and getting back into your tank, keeping your fish happier and healthier. It can also mean you can go longer before cleaning your aquarium. 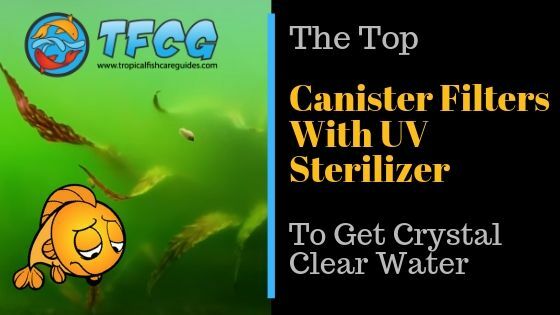 Without further ado, here are our picks for the best canister filters with UV sterilization to eradicate algae spores and harmful bacteria. 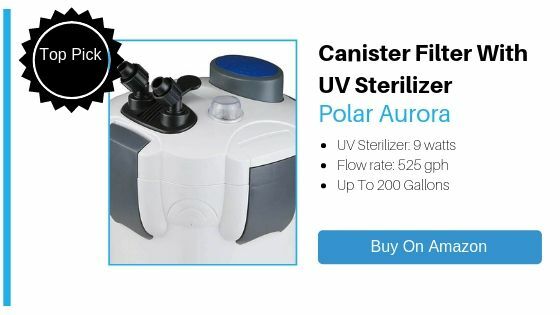 The Polar Aurora is one of the most powerful canister filters on our list. It can handle a 200-gallon fish tank on its own. It also has four trays so you can include your choice of filtration media. It also has a self-priming pump which makes it easier to maintain and clean. If you need a filter that can handle up to 150 gallons and works so quietly you won’t notice it, the Oxyful may be right for you. It also has four media trays so you can add what you want to them. This canister filter works in both fresh and saltwater tanks. For aquarium enthusiasts that need a smaller filter, there’s the Penn Plax Marlin. This canister filter can handle up to 90 gallons and is highly efficient and operates silently. Another advantage of this filter is its compact size which allows it to fit nearly anywhere. 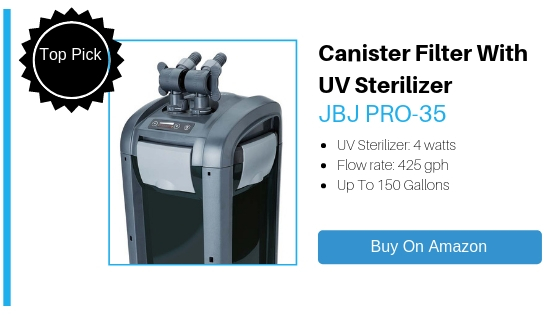 What’s nice about the JBJ Pro-35 filter is that it’s got a one-touch start, so once you’ve got it in place, you can immediately put it to work on cleaning your tank. It also shuts off just as quickly to maintain it. Because the flow rate is variable, you can adjust it to suit any size aquarium. 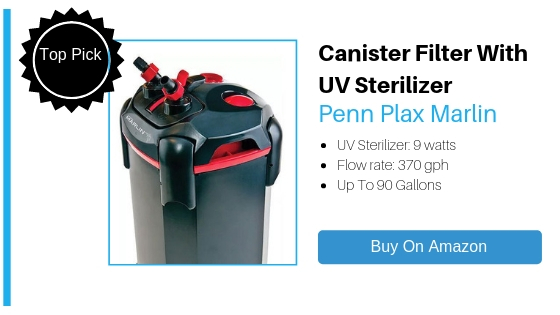 Another filter from this company, the Penn Plax Cascade is perfect for someone who’s buying a canister filter for the first time. It comes with everything you need and estimates you can have it up and running in less than 30 minutes! The specs listed here are for the largest size. You can also get smaller filters with less power for a smaller tank. With four media trays, you can mix and match media to get the right combination for your tank. The Sunsun HW-7034B also has a spray bar designed to better aerate the water. As with some of the others on our list, you can choose from a variety of sizes to meet your needs. 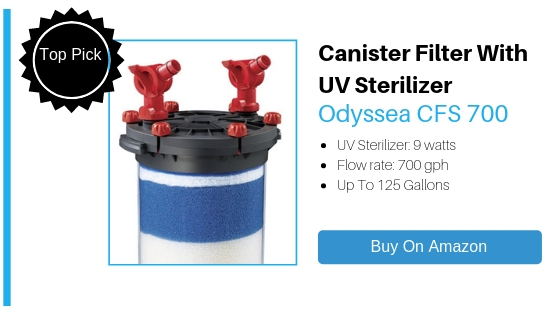 If you don’t feel ready to mess around with filter media, the Odyssea CFS 700 may be the right canister filter for you. Instead of media baskets, they have a set of filters which are easy to remove and clean. Because this filter has an adjustable flow rate, it can work on a variety of tank sizes. Now you have a list of our favorite picks for canister filters that have a UV sterilizer. As you can see, there’s a variety of options so you can choose the one that fits your budget and tank size! If you want more information about filters and our reviews of them, be sure to check out our post on the 29 best filters of 2019. It’s a great piece to read if you still haven’t found what you’re looking for.